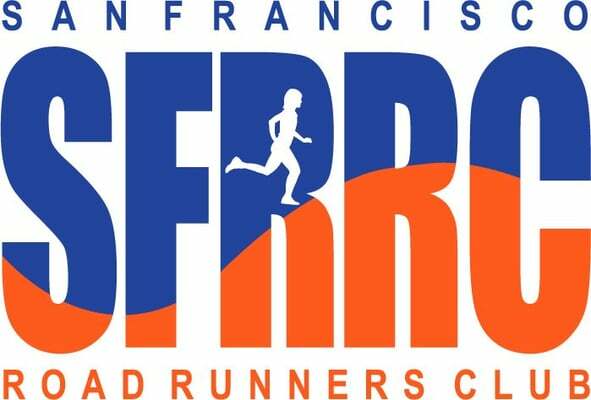 San Francisco Marathon, here I come! It has finally hit me that I will be running the San Francisco Marathon in the morning. Honestly, it is odd how little this has affected me. I know I’ve been going to Saturday morning long runs and doing more running in Golden Gate park, but I didn’t realize what it was leading up to. I blame this on the fact that all of my previous races have been “destination” choices and I’ve never gotten to sleep in my own bed the night before. But here I am, heading off to bed at 9:30pm so I can be prepared for a 4:30am wake up. 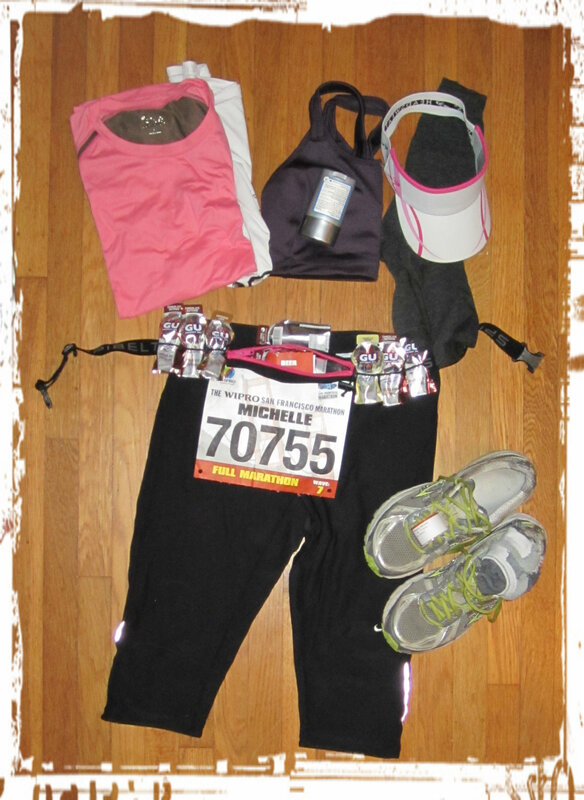 I spread out my clothing on the floor (which got some entertaining remarks from my roommate) and made sure I had all of the necessary pieces (think 8 gels is enough?). I’ll admit that I’m scared. I know that I’ve run on these hills before, but that doesn’t alter their severity. I’ve changed up my strategy for this run, deciding that I will stick to my 6/1 intervals regardless of my pride. But in addition to that nervousness, my friends will be manning a water station at mile 19 and I’m embarrassed that they will see how slow I am. It doesn’t help that I also have a head cold (thanks coworkers! ), thank goodness it is just above the neck. Here is hoping that these nerves and aches will be gone by the time I cross that start line. And as I prayed before – Running Gods, please keep my feet from throbbing, my calves from cramping, my knees from aching, my tummy from churning, my chest from chafing, and my mind from straying from a positive outlook. Best of luck to all the other great folks out there running and racing tomorrow! As of this morning I am officially 25 years of age. I know that isn’t a particularly exciting birthday, but hell, I’m going to enjoy it! I plan to spend today doing the things I love the most; this morning I went for a run with my running group to prepare for my upcoming marathon (next week, eep) and soon I’ll be relaxing with (some of) the people I love in the park. This summer I’ve begun to learn about truly enjoying life. I’ve found that I’ve had a better attitude, am awkwardly happy often times, and more positive about each opportunity I’m offered. Some of this has to do with the improvisation course I took this past year that opened my eyes to saying “yes”, but much of it is because I’m learning to take things in stride and accept reality. It is a wonderful feeling and I hope to foster it for the rest of my life. Also in honor of my birthday and to help my fundraising efforts, I am throwing a raffle. Each raffle ticket costs $1.80 and as a special (extra Jew-wy deal), for $18 I will give you 18 entries. Now what will you win? 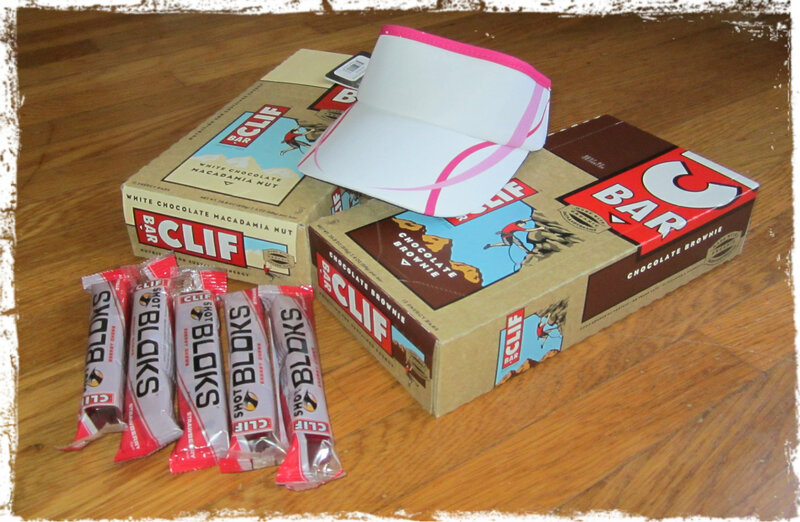 I have two prize packages, both come with an awesome Headsweats Supervisor in pink (this visor is amazing, more on it to come), two cases of Clif Bars (varying flavors), and five packages of Strawberry Clif Shot Bloks. It is as simple as that. If I am able to reach the $900 donation mark by July 29th (when I run the San Francisco Marathon), I will add some fantastic bonus goodies for you amazing folks. And if you aren’t already aware, I greatly appreciate any amount that you can give. Every dollar donated will go to support those in need. This is truly all I want for my birthday, to help raise money for a cause that is near and dear to my heart. Thank you for your support. I hope you all have a glorious Saturday! Saturday’s run was honestly one of the best I’ve ever had. Not because of the distance (I only managed 18.5 of the 19 I had planned), or the speed (sloooow), but of the overall way my body and mind meshed. It was a long day, with an early start, but somehow things went much better than I had expected. I woke up at 4:30am to a miserable Charley horse, clutching my leg in pain and getting angry with myself for being dehydrated. I immediately chugged some water and returned to bed until 6am. In earlier days I would have taken this incident as a bad omen for my run and come up with an excuse to sleep through my run. But not Saturday. At 6am I got out of bed, consumed a lot more water and some challah. By 6:45 I had suited up and was ready to get out for this long run. And wow was it chilly! Since I live in the foggier area, it was kind enough to be windy and cold. Great, right? So I started on the 3.5 mile journey to the office where a running club was meeting. A mile in I found myself going in the wrong direction and had to take out my phone for directions. Just as the group was preparing to head out at 7:45, I shuffled up. I managed to run 4.25 miles to the start (yay for getting lost!). We separated into groups and went off. This running club incorporates intervals into the workout and my group does 6 minutes of running, 1 minute of walking. As we began to run towards the hills I felt okay, my mind knew I could do it. Even with the hills I was able to keep up without falling behind. Yes, there was one hill that threatened my being, but I was able to complete it without discouraging myself from continuing on after. Last week when I ran with this group, I deeply considered dropping out at 8 miles instead of 12. I didn’t, but as the 10 mile mark came up I had to drag myself off to continue. This week I knew that I was doing 14 with the group and that I had no option otherwise. Each time some people fell off to do a shorter distance I waved at them instead of trying to sneak into their group. It never crossed my mind that stopping was an option. Slowing down was something I considered, but the two other individuals pushing me to 14 miles didn’t seem interested in changing pace so I moved ahead with them. And as we returned to the starting location I was overjoyed to know that I had done it. I conquered the hills, finished (most of) the miles, and was still in a very happy place. How do you mentally fuel yourself during runs? What is your mantra to keep moving? 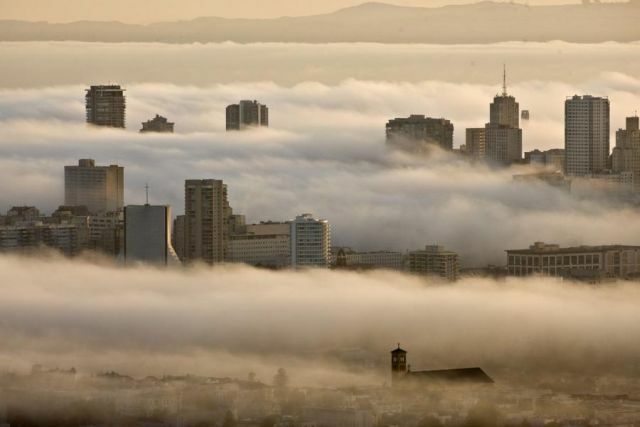 As of last week, I officially live in San Francisco. I made the decision to move into the city so I could have a shorter commute and finally take advantage of what the city has to offer. Of course it was more than a pain in the neck to find an apartment for three months, but fortunately I paired up with another intern and we found a great place. Best part about it? 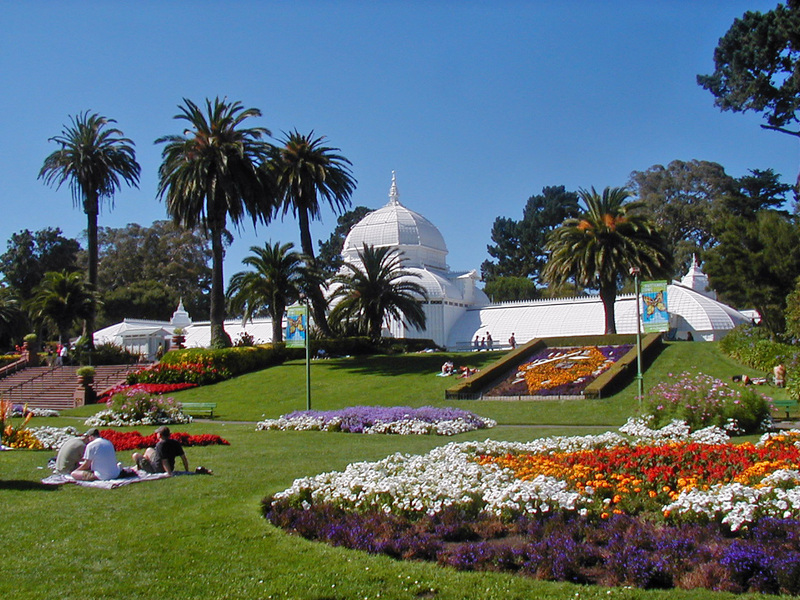 I’m two blocks from Golden Gate Park! The park offers some fantastic fields, museums, and, most importantly, running routes. I mentioned earlier in my goals post that I wanted to make the most of my time here and I made sure to do that this week. On Tuesday, after a long day at work and grocery shopping (which is more troublesome than I had imagined), I returned home, suited up, and went out toward the park. Unfortunately I got a late start so I entered the park as it was getting dark out. Foolishly this didn’t stop me… I followed the trail out past the Conservatory of Flowers, up to the Academy of Sciences, around a few soccer fields and back the hill to my apartment. It was fantastic, except for the part where I was scared by my own shadow. Apparently this happens to me when it is dark out, I honestly thought someone was following me for a second until I realized it was my own shadow. I’m brave like that. Then on Thursday, after having cocktails at work (it was seriously for a job assignment), I was dragging. I had no desire to go for a run, especially when I found that the park was covered in a thick, cold fog. I had no idea that my new apartment was in the foggiest part of the city (whoops?). But I suited up anyway and pushed myself out the door for what was the best run I’ve had in a while. A speedy four miles. And it turns out the fog can be more refreshing than I had expected, it kept me cool and spritzed the entire time. It seems there are advantages to this weather. Although it can be a downer to drive into the fog, it feels great to be cooled down by it on a long run. Yes, it means that the area is ten degrees colder than my usual Stanford temperatures, but I must remind myself that I have always enjoyed the cold more than the heat. How do you feel about the weather in your hometown? How does it affect your exercising?